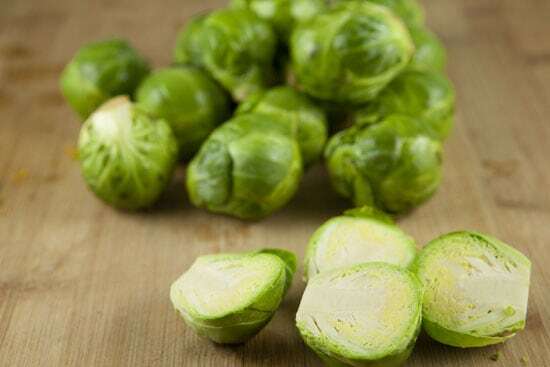 Brussel sprouts are the most divisive of vegetables. People either love them or hate them. It has also been my experience that the people who hate them haven’t really had them prepared the correct way. They get a very bad rap unfortunately. So I was happy to see brussel sprouts win the poll last week because it meant I got to experiment with a roasted sprouts recipe I’ve had in my head this winter. Not only are these Pomegranate Sprouts delicious because they are roasted until they are almost crispy, but then there are some great flavors and textured piled high on top of the sprouts. The dish is meant to be a side dish, but honestly I could almost make a meal out of it just by heaping it in a large bowl. These are just that good. Roasted brussel sprouts with lots of citrus zest, pomegranate seeds, and pine nuts. This is a perfect winter side dish! 1) Preheat oven to 350 degrees Fahrenheit. Slice stem off of brussel sprouts and cut them all in half down the stem. 2) Toss sprouts in olive oil and season with salt and pepper. Roast sprouts for 20 minutes until they start to brown. 3) While sprouts roast, toast pine nuts over low heat in a dry pan for a few minutes until they are fragrant and lightly browned. Be careful as they will burn quickly. 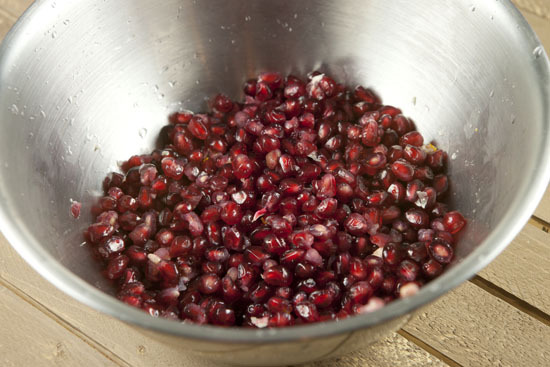 4) Seed a pomegranate by cutting it into quarters and peeling apart the insides under water in a large bowl. The seeds will sink and the white pith parts will float. Drain off water to be left with just seeds. 5) Zest one lime and orange and reserve zest. 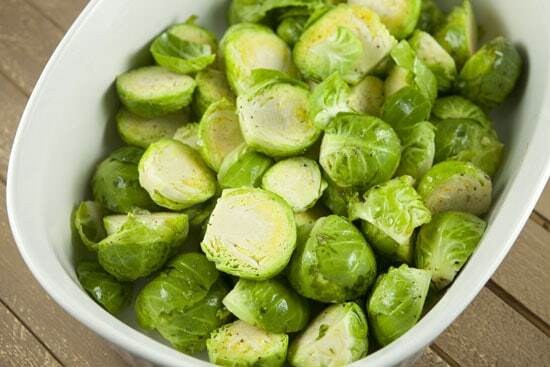 6) Remove sprouts after 20 minutes of roasting. Stir and add in Serrano pepper. Return to oven for 15 minutes. 7) Remove sprouts and toss with honey and zest. Return to oven for five minutes. 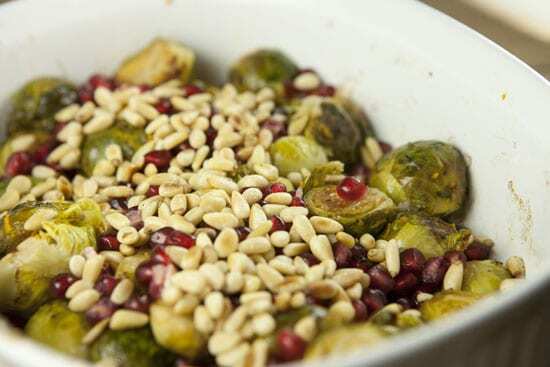 8) Top roasted sprouts with pomegranate seeds, pine nuts, and serve immediately! Brussel sprouts are strange little things. They are almost like tiny cabbages. If you have the guts to chomp into one raw, you’ll find them to be almost bitter. This bitterness mellows though when you roast them and some of the outside layers of the sprouts turn crispy. While they look kind of awkward, they are pretty easy to prepare. Just wash them and then cut the very end of the stem off of each sprout. Cut them in half or if they are very small you can leave them whole. Don’t worry if some of the outer leaves fall off as you prepare them. 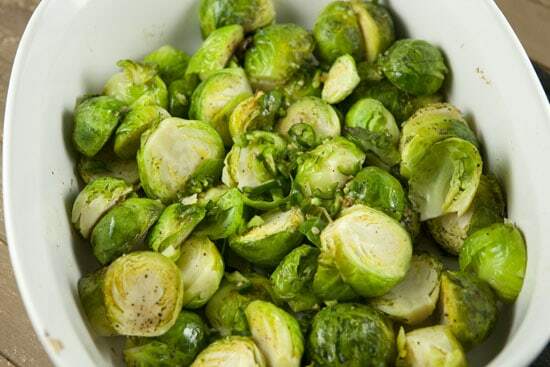 Toss the sprouts with olive oil and season with salt and pepper. Place all the sprouts in a baking dish and bake them at 350 degrees. These will need to bake for at least 40 minutes in total, but we’re going to add in some flavors at various points. After twenty minutes of baking, remove the sprouts and give them a stir. Add in the minced Serrano at this point which will give them some heat. This isn’t an essential add-in but I think a little heat helps round out the flavors. Return to the oven and roast for another 15 minutes. After this second roasting, the sprouts will be nicely caramelized. 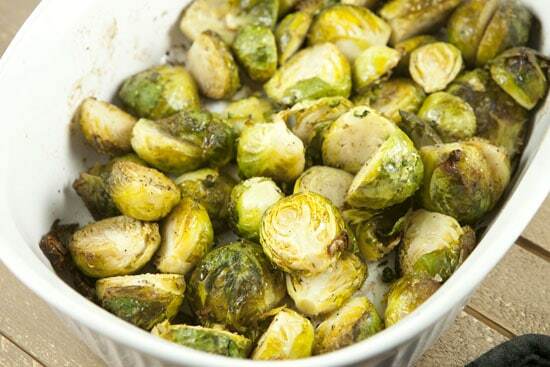 While the sprouts are roasting, you can work on the flavor-packed add-ins for this dish. 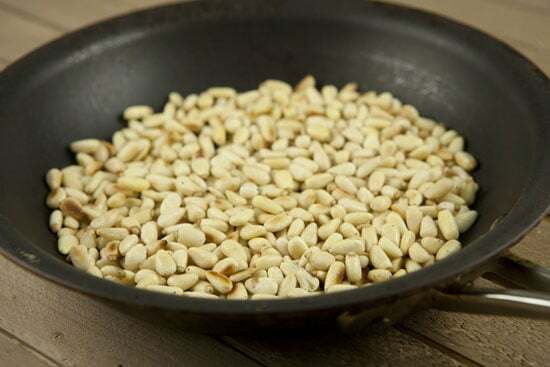 For the pine nuts, just toast them on low heat in a dry skillet. Do not leave these as they will burn quickly. After a few minutes they should be fragrant and lightly browned. Immediately remove them from the heat when they are at this stage. These days you can buy pomegranate seeds that have been seeded already, but I still like to work with a whole pomegranate. It’s a great deal and they aren’t that hard to peel. The key is to cut the pomegranate into quarters and then do the peeling under water! 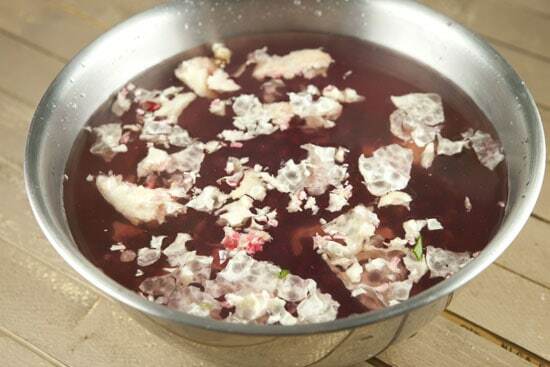 This will prevent pomegranate juice squirting all over your kitchen and the seeds will sink to the bottom of the bowl while the white pith floats. Once you have all the seeds picked out, you can just drain off the water and you’ll be left with pretty little seeds! It really just takes a few minutes to peel the pomegranate using this method. You won’t need all of these for this recipe but keep them! I like pom seeds on all kinds of stuff, especially oatmeal. You won’t need all of these. 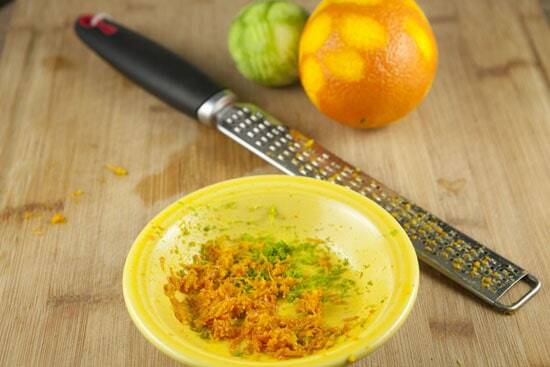 The only other add-in you’ll need is some honey and zest from a lime and orange. The zest is very important. When the sprouts are almost done roasting, stir in the zest and honey and return to the oven for just five minutes so the flavors can combine. Then pull the dish. The dish will smell amazing because of the citrus and honey. Sprinkle the dish with pomegranate seeds and pine nuts and serve immediately. Go heavy on the toppings. They totally make the dish. 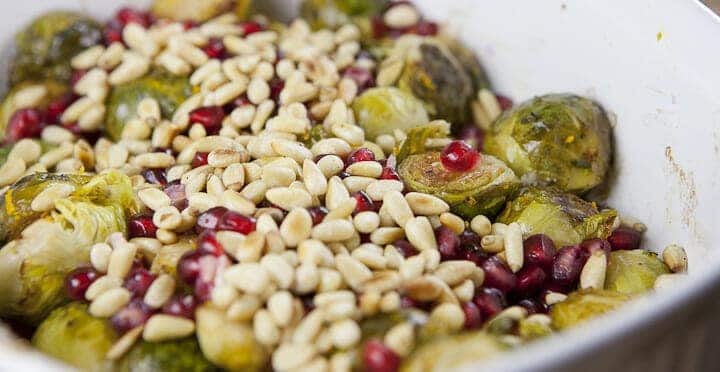 If you don’t like brussel sprouts after trying this Pomegranate Sprouts dish then I will allow you to say that you truly don’t like brussel sprouts. In my mind though, it doesn’t get much better than this for a healthy winter side dish. I used to be in the camp that didn’t like Brussel Sprouts, but after having to prepare them day in and day out at work for our winter menu, I’m sold. And I think you’re right, I never had well prepared brussels! We finish ours with a hit of raspberry vinegar that downplays the bitterness and adds a nice sweetness, kind of like I imagine your citrus and honey do to this – definitely going to give it a go! I know how great toasted pine nuts smell and that’s how I know this is a great dish. I love, love roasted brussel sprouts–with pine nuts and pomegranate–this made my mouth water. Hmm… Not sure I know of one. I think you could just leave out the pine nuts and still have a good dish! Just made these–they are phenomenal. I think the serranos are a really nice touch. I used what pine nuts I had in the pantry, which was less than the recipe calls for, and Heather, I agree with Nick–I think the recipe would be great without them as well.